A mini tummy tuck, or as it is scientifically known, partial abdominoplasty, is a procedure performed for ridding Huntington Beach patients of excess fat below the navel and restoring a flat stomach. Women who have recently given birth or lost excess weight usually have sagging skin around their belly, which droops over their waistline. With a mini tummy tuck, they can regain a flat stomach and get rid of the excess fat completely. As compared to a tummy tuck, a mini tummy tuck is less invasive and takes less than an hour. 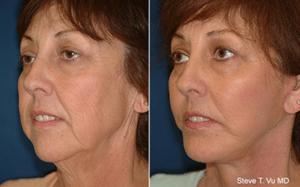 The recovery period for this procedure is also shorter. During the process, a short incision is made, usually smaller than that for a full abdominoplasty. The belly button might not require repositioning to look natural. Up to half of the skin from the underbelly as well as the subcutaneous tissue from that region are removed. During the procedure, the surgeon inspects the muscles in the pubic and lower abdominal region. If they are weak, surgery is performed to correct them. A lower mini tummy tuck is advised to Huntington Beach patients when the skin above the navel is firm and does not require any working. This procedure is performed in the upper abdomen. Even the incision is made close to the under-breast. Muscle tightening is recommended after the muscle is examined. In this case, the skin on and above the navel area should be loose and require the removal of skin as well as subcutaneous tissue. In certain cases, partial abdominoplasty is combined with liposuction to deliver the ideal results. This is the case when excess and sagging skin is accompanied by excess fat in the abdomen or pubic area. The fat is sucked out during the liposuction and after that the mini tummy tuck is performed. This ensures the excess fat around the abdomen does not affect the skin in any way. In most cases, a mini tummy tuck is advised for Huntington Beach patients with little fat beyond their waistline, or else a full tummy tuck will be suggested. You will have to discuss the best course of action with your surgeon. The surgery can be performed within an hour. This means the scope of the procedure is limited and doesn’t take up much time. The tools and facilities required for the procedure are limited as well, as a mini tummy tuck can be carried out using standard IV sedation and a local anesthetic. The patient doesn’t have to be put under completely. The incision made for the removal of fat from the body is smaller than for a tummy tuck. It is usually made below the waistline and goes across the pubic bone, with the main point of incision being just above the pubic hairline. Another advantage of this is that the scar from the surgery is not clearly visible and can be hidden under underwear and your bathing suit as well. The position of the belly button will remain the same, even if the size of your tummy changes drastically. Furthermore, the stretch marks apparent on your abdomen will be gone after the procedure. The recovery period for a mini tummy tuck is also short. Within a couple of weeks, Huntington Beach patients can resume your normal routine and even start working, depending on the nature of your job of course. Overall, the healing process takes, at most, 8 weeks. Also, as with tummy tucks, the results of mini tummy tucks are long-lasting and you can expect the firmer and better looking skin to stay for a long period of time. You have a small amount of fat around your abdomen, which is causing the skin to sag but not excessively. You want to restore your tummy to a flat shape to make it appear better and more desirable and other conventional methods, such as diet and exercise, have not worked for you. Your abdominal muscles do not bulge when you lie on a flat surface. Huntington Beach patients who have toned abs should opt for a mini tummy tuck as they don’t need excess skin or fat removal. It is generally suggested that you opt for surgery as a last resort, as getting a mini tummy tuck, especially if you have lose weight recently, can cause complications. The cost of a mini tummy tuck depends on the procedure your doctor will perform. There are multiple options available, as highlighted above. Generally, a comprehensive procedure will cost you around $6,000 while a simple surgery may cost between $4,000 and $5,000. The cost generally varies from region to region and is affected by numerous factors, which means you can have to spend as much as $15,000 on the procedure. Some insurance providers do cover the cost of mini tummy tuck if your doctor recommends it as a necessary procedure for preventing or treating any health problems. The obvious results from a mini tummy tuck are a flatter belly. The abdomen will be firmer and the navel skin tighter. Of course, there may be variances based on the area from which the skin has been removed or worked on and if liposuction has been performed. As a result of the surgery, you will have a scar where the incision is made, which will heal in a few weeks but will remain visible. The results of a partial abdominoplasty are permanent and long-lasting. You can expect the skin around your abdomen to look firm and tight, and be free of stretch marks and other skin problems which come with sagginess or looseness. For more information on a mini tummy tuck or to schedule a consultation with Dr. Vu, contact our office in Huntington Beach at (714) 848-1133.